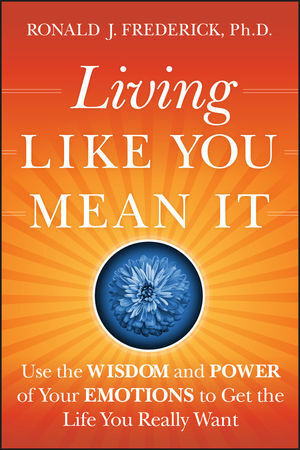 In LIVING LIKE YOU MEAN IT, author Ronald J. Frederick, does a brilliant job of describing why people are so afraid of their emotions and how this fear creates a variety of problems in their lives. While the problems are different, the underlying issue is often the same. At the core of their distress is what Dr. Frederick refers to as feelings phobia. Whether it s the experience of love, joy, anger, sadness, or surprise, our inborn ability to be a fully feeling person has been hijacked by fear--and it s fear that s keeping us from a better life. The book begins with a questionnaire-style list that help readers take an honest look at themselves and recognize whether and how they are afraid of their feelings. It then moves on to explore the origins of fear of feeling and introduces a four-part program for overcoming the fear: (1) Become aware of and learn to recognize feelings--anger, sadness, joy, love, fear, guilt/shame, surprise, disgust. (2) Master techniques for taming the fear. (3) Let the feeling work its way all the way through to its resolution. (4) Open up and put those feelings into words and communicate them confidently. With wisdom, humor, and compassion, the book uses stories and examples to help readers see that overcoming feelings phobia is the key to a better life and more fulfilling relationships. RONALD J. FREDERICK, Ph.D., is a cofounder of the Center for Courageous Living, which offers innovative therapy, coaching, and consulting. He is a licensed psychologist and life coach with more than fifteen years experience helping people get the life they really want. Frederick is a senior faculty member of the Accelerated Experiential Dynamic Psychotherapy Institute as well as the clinical supervisor of Park House, an outpatient program of Abbott Northwestern Hospital in Minneapolis, Minnesota. 1. To Feel or Not to Feel. 2. How the Heck Did I Get This Way? 3. Step One: Becoming Aware of Your Feelings. 4. Step One, Continued: Becoming Aware of Your Defenses. 5. Step Two: Taming the Fear. 6. Step Three: Feeling It Through. 7. Step Four: Opening Up. 8. Putting It All Together.